The USS Highlander (NCC-74962) is an Intrepid-class starship commissioned in 2384 under the command of Captain Tim Williams. The ship was originally assigned to the task force known as Sigma Division in its explorations of the Gamma Quadrant, and was then assigned for a number of years to Epsilon Force, exploring the closest regions of the Delta Quadrant. The ship was almost completely destroyed during a crash landing in a classified incident on the planet of Talos IV, and was reconstructed over the following two years, being re-launched in 2388. The Highlander was built at Antares Ship Yards in the Bajoran sector. Construction was supervised by Lieutenant Commander Venak, and many of the innovations and improvements developed by the crew of the Starship Voyager were included in the Highlander's design, such as the astrometrics lab and sensors, which effectively superseded the standard stellar cartography lab used by all other vessels. Some of the Highlander's technology was derived from technology originally used by the Borg, and adapted to fit Federation technology by the former drone known as Seven of Nine. On stardate 60439.1, in the year 2383, the Highlander was launched from the Antares Yards. 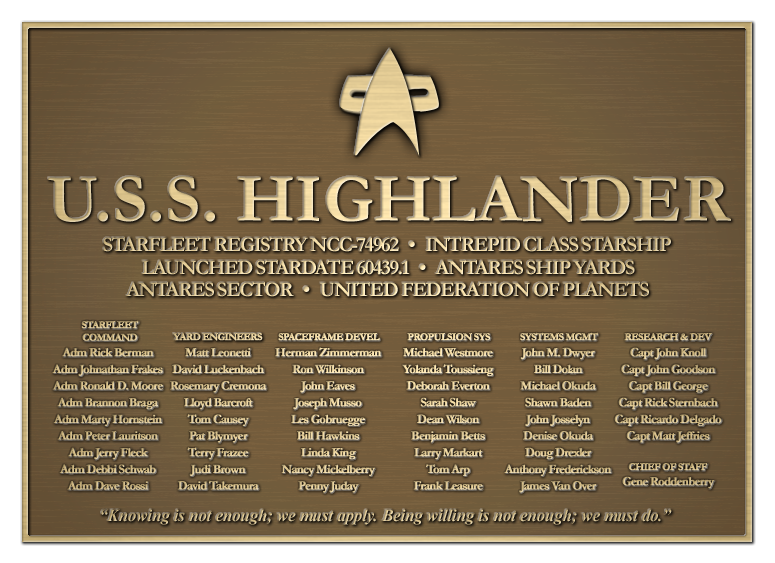 Six months later, on stardate 61003.5, the Highlander was commissioned. Final systems completion and shakedown was conducted at space station Deep Space Nine. Captain Tim Williams took command of the ship on stardate 61050 at the order of Vice Admiral Jill Garner. Assigned to the command designated as Sigma Division by Starfleet Command, the Highlander joined the task force responsible for renewing exploration of the Gamma Quadrant, and ensuring that its independent worlds were not exploited by other travellers to the region from the Alpha Quadrant. Proceeding through the Bajoran Wormhole, the Highlander's first mission was to investigate rumoured sightings of Ferengi near a planet previously surveyed, and marked as being primitive enough for the Prime Directive to apply to any contact with the world. Fearful that the Ferengi might try to exploit the native population, Captain Williams ordered an away team to beam down to the surface wearing the clothes of the natives with the task of locating any Ferengi influence. The Ferengi did not prove to be difficult to locate, as they had set themselves up to be mythological rulers of the planet's inhabitants, and made appearances regularly to demand tribute from the populations of the towns they visited. Meanwhile, the ship had detected a possible power signature on one of the moons of the planet, and Williams took his second officer in the Highlander's AeroShuttle to investigate. Discovering it to be the facility to which the Ferengi were sending their tribute - and also retreating to at the end of each day, the two officers were able to stun the Ferengi working within, and await the return of the two who had been making themselves known to the inhabitants - detaining them aboard the ship as soon as they returned to the facility before ordering his crew to remove the compounds vital components - rendering it inert until a team could be sent to remove it entirely before the locals developed enough to discover it for themselves. The only other mission that the Highlander had in the Gamma Quadrant saw the ship take on Admiral Gwena Max, who under protest from Captain Williams ordered the ship to open an aperture into fluidic space to search for the crew of a ship that had been lost some years prior. It was later revealed that Max's insistence to violate the region of Species 8472 was because she had a close relative who served aboard the lost vessel. Fortunately, the crew were able to accomplish their mission without igniting a war with the alien species. Shortly after, the Highlander was reassigned, this time to the command known as Epsilon Force, under the command of Admiral Max. Epsilon Force's mission was to continue exploration of the Delta Quadrant, which had become technically possible by the newly devised use of the slipstream drive technology developed on Voyager. 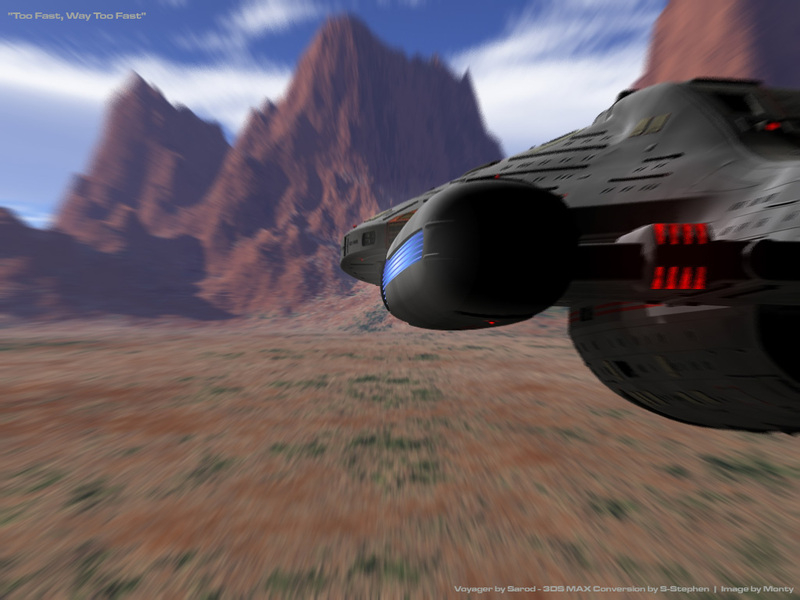 By combining the computing power of a number of starships working in tandem, Starfleet believed that the computers could overcome the problems that had almost destroyed any Federation starship to attempt to use the discovery, and the ships of Epsilon Force were to be the first to attempt a long-term flight using the new networked computer protocols. The flight was almost completely successful. 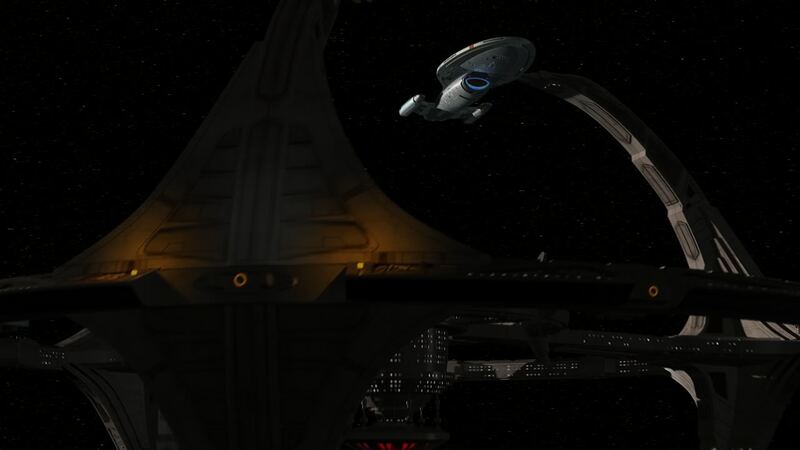 Whilst all of the vessels were able to reach the Delta Quadrant, a number of them including the Highlander were thrown out of the slipstream early, and suffered damage as a result of the stresses exerted on their hulls. These vessels were able to continue the journey to the rendezvous coordinates using conventional warp drives, and the slipstream drives - having been burnt out entirely by the flight in all ships equipped with them - were subsequently removed. The Highlander took up operations in the Delta Quadrant as the flagship of Fleet Captain Williams - later promoted to Commodore - who had been placed in command of the operational forces in the region under Task Force 84; reporting directly to Admiral Max. He continued in the position after Admiral Max was succeeded as commander of the fleet by Admiral Koolah. During its tour in the Delta Quadrant, the Highlander spent much of its time re-establishing contact with those races within reach of the fleet that the Starship Voyager had already contacted over five years previously, and following up on the reports of the other vessels operating in the region, which were able to travel farther and stay out of contact for longer in order to explore the region and begin the task of dropping subspace amplifiers to extend long-range communications. 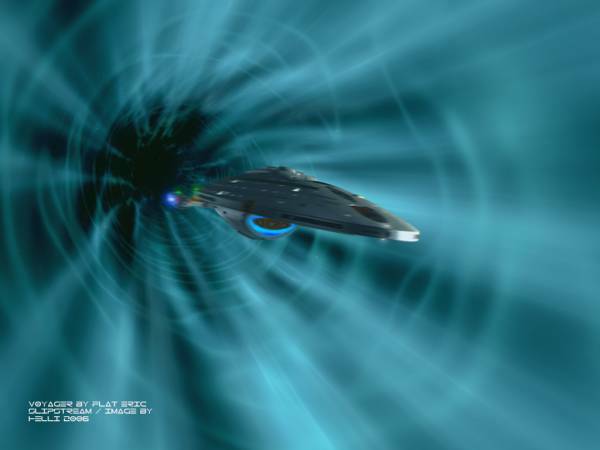 At the end of the first year of operations in the Delta Quadrant, the fleet was able to successfully open an artificial wormhole back to the Alpha Quadrant; allowing those vessels which had travelled to the region with the experimental drives to be resupplied and for their crews to have the opportunity to transfer back home. It also enabled the fleet to be doubled in size, with a second task force opening in parallel to Task Force 84. Mid-way though 2386, the Highlander was recalled through the wormhole to Earth, where Commodore Williams was to be reassigned to head up the exploratory efforts in the Alpha Quadrant, with his first officer, Commander Black, replacing him in command of the vessel. 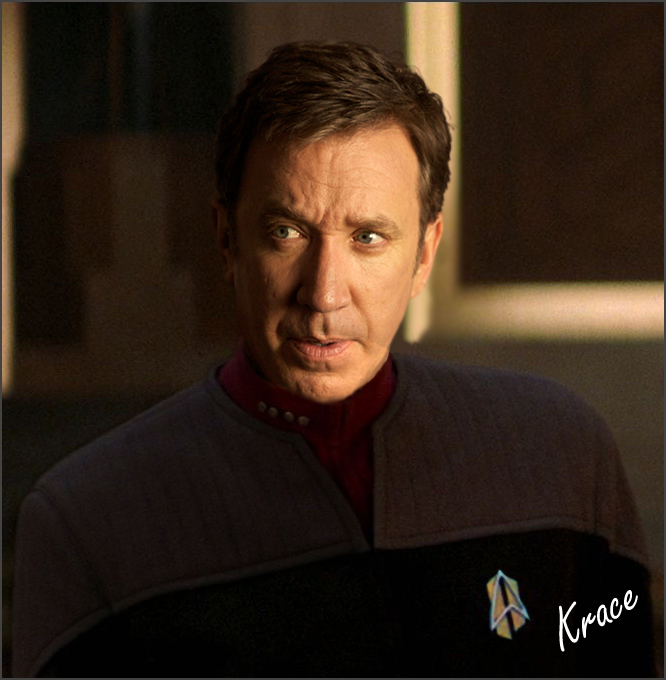 It was during his brief tour at Starfleet Command that Williams learnt of the expedition sent by Admiral Rotchen to the forbidden planet of Talos IV, and convinced Captain Black to take the Highlander and a crew consisting only of the command staff of the vessel to the planet in order to remove the expedition, and stop the experiments being conducted. The Highlander was severely damaged in the ensuing space battle with the starship under Rotchen's command, and crash-landed hard on the planet's surface. 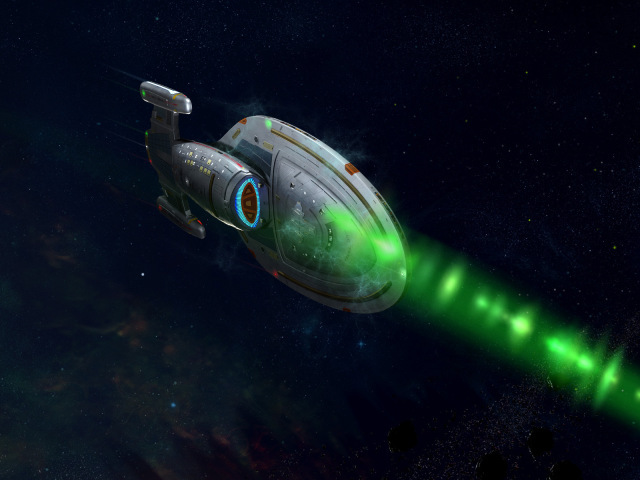 Knowing that the ship's presence on the forbidden planet may cause stray power signatures and ghost readings to draw other vessels there, Starfleet sent a Corps of Engineers vessel to retrieve the wreckage and return it to a ship yard to be decommissioned and scuttled. Demoted to captain, Williams was able to use his contacts to pull in enough favours to have the ship reconstructed instead. Due to the sheer extent of the damage suffered by the ship, it had to be stripped back to its spaceframe to enable the proper structural repairs to take place. With a team working on the vessel for over eighteen months from the time it was brought to the ship yards, the Engineering Corps were able to finally classify the vessel space-worthy again in 2388, and Captain Williams was once again assigned as its commanding officer. With all of his former crew since reassigned to other vessels, and his former first officer now having a command of his own, Tim was forced to recruit a new crew to the vessel, which was due to return to service in Epsilon Force. However with the devastation caused to Romulus and the Romulan Empire by the Hobus Hypernova, the ship was instead assigned to the 6th Fleet, along the Romulan border to provide additional assistance and patrols while a large number of ships were sent into the Empire as a relief force. By 2390, the Sojourners had become a credible threat in the galactic south, and their attack on Starbase 332 prompted the 11th Fleet to request the transfer of a number of active starships with their captains to bolster the fleet numbers, whilst a number of new vessels were still under construction and without an assigned commander. The sixth, seventh and third fleets all agreed to provide ships, but in a number of cases elected to keep much of the crew of the ships they were sending within their own structures, and so the Highlander was sent to Cestus III with the minimal skeleton crew required to see the vessel safely to its new command. Landing the ship on the surface in order to shut down as many functions as possible without the crewmen to maintain them, the ship was then inspected by a team of engineers to ensure that the reconstruction works conducted on the ship had held up to active duty. Two months after the ship's arrival at Cestus, Starfleet transferred the majority of the former crew of the USS Endeavour to the Highlander, as that ship had been presumed destroyed along with its captain during an encounter with a lone Borg Cube in the unexplored regions beyond Klingon space. A number of the Endeavour's crew had requested a transfer elsewhere after their counselors cleared them for active service, and so Captain Williams had to complete his staff roster with transfers from elsewhere in the fleet. After a year of operating in the fleet, the ship was assigned to the new initiative to explore the Delta Quadrant, Task Force 37, and was ordered to Utopia Planetia Fleet Yards to complete a refit to prepare her for this task. As of 2391, at least 9 species were represented among the 155-strong crew compliment, including El-Aurian, Andorian, Vulcan, Pacifican, Ktarian, Arkenite, Aurelian, Skagaran and Human. Although Starfleet crewmembers staff the vital positions on board the Highlander, civilian crewmembers are allowed to hold important jobs in the ship's science and medical departments, as well as support areas like the mess hall. Though the ship has the facilities and capability to support civilians aboard, unlike the much larger Galaxy-class ships, the Highlander does not usually support the families of its crew members, except in individual circumstances as determined by Captain Williams. Crew evaluations are conducted every six months, and are supervised by Commander Hawke, the ship's executive officer. Although Captain Tim Williams has commanded the Highlander for most of the starship's life, his former first officer, Jonathan Black, was promoted to captain in 2386 after Williams was assigned to Starfleet Headquarters, and was in nominal command during the events which lead to the ship's crash-landing on Talos IV. From 2386 through to 2388, the ship was without a captain due to the extensive repair works, but officially fell under the command of Captain Gret th'Razorai, the commander of the Starfleet Corps of Engineers yard within which the Highlander was berthed. This page was last edited on 18 February 2017, at 23:28. Content is available under GNU Free Documentation License 1.3 unless otherwise noted.